In every moment, your life is speaking to you. Do you hear it? Sometimes it is ever so faint. Listen. Most often, if you’re like me, we coast on auto-pilot. Numb, really. Simply going through the motions of everyday life, but what about when a thought simply pops into your head?? Sure, minds are designed to run non-stop with ideas, feelings, and more… But when something enters your mind out of nowhere, then it is not your thought. Pay attention!!! 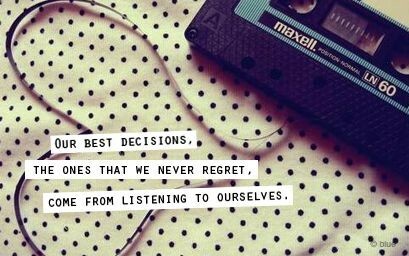 Listen to your inner voice. ALWAYS. It is your BFF (best friend forever) for life. The quiet voice within NEVER lies. Never leads you astray!! Consider it your inner-warning system which is a combination of insight, intuition and instincts. Sometimes it is a feeling… Ever feel the hairs on the back of your neck rise? What about a cold chill for no particular reason? Other times an actual voice inside beckoning you to do something, call someone, or perhaps think better of a decision… for your own good!! Where does the voice come from, anyway? Some believe it is God speaking. Others believe it is your angels… perhaps even your guardian angel most times. While others simply think it is your conscience. It could even be your soul/spirit guiding you in a particular direction. Maybe it is a grand culmination of all of these sources? 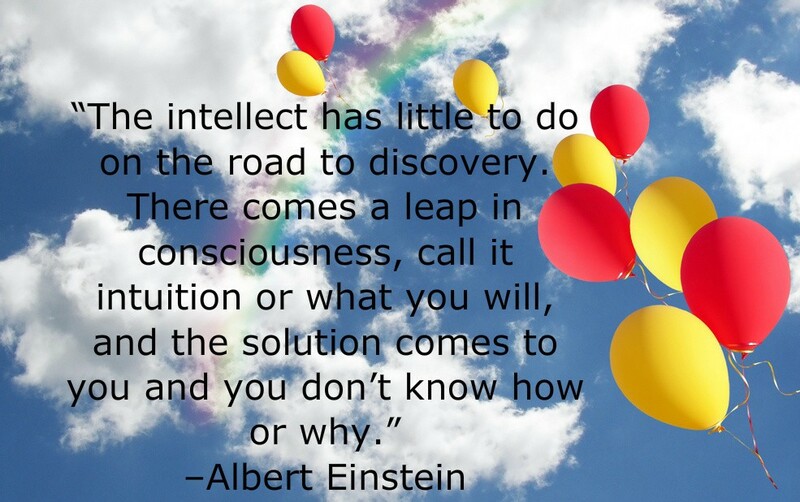 I’m not particularly wise enough to know the answer, but whatever IT happens to be… when it speaks to you… LISTEN UP!! It has taken me years to start to pay attention to the voice in my head. I’ve made the mistake… too many times to count… of ignoring my inner voice. Sometimes you don’t even know what exactly you’re hearing or what it means for that matter. Maybe there is a lesson for you… other times it is a signal that danger is near… or maybe a desire to do something… or perhaps it is urging you to be an earth-bound angel by assisting someone in need. My inner voice has blessed me upon countless occasions. I’ve learned to heed the call when my inner-warning system goes on high alert. Let me share some examples where this has come into play and how it has transformed my life. The summer before my college junior year, I was home during break… doing a big bunch of nothing in particular with my time. One day, I was driving around aimlessly and I drove past the street where my friend Theresa lived. All of a sudden, I made a U-turn and stopped by… unannounced. Dunno why, but something inside told me to stop by and see how she was doing. Keep in mind, I hadn’t seen or talked to Theresa since high school graduation three years earlier. When I was younger it always made me ANGRY when people misspelled my name. Now, I know my parents picked an unusual spelling for Renae, but dang it… if you KNOW me, then you damn well better know how to spell my name. When I met Theresa during my junior year at a new high school, she never could remember how to spell my name, so she made a game out of it. Even signing my yearbook, “Renaeeaaeaae, fun for me to say and spell…” From her it didn’t make me mad. It was cute. It was endearing. We made it an inside joke. To this day she is the ONLY one who could get away with it!! LOL!! Upon arriving at her door, in true fashion, she greeted me with “Renaeaeaea! !” And, we picked up right where we left off. We sat on Theresa’s bedroom floor, chatted up about college life, discussed how college was different yet the same as high school in many ways, shared our hopes and dreams and gossiped… trying to catch each other up on what was going on in our lives. She mentioned she was surprised I stopped by… well, truthfully I was too!!! We had a great conversation. Theresa was leaving to return to college soon, so it was really nice to catch up. Then I got the call. Theresa had suffered a brain aneurism. She was talking to one of our friends on the phone. During the call, Theresa mentioned “her head hurt… it really, really hurt” and then she was silent. September 3, 1993 she died. Theresa was gone. My friend passed away only a matter of months after her 20th birthday. Yep, I was sad. I was shocked. How could it be? And I couldn’t believe I was just with her less than a few weeks earlier. Would I have said anything different had I known that would be the last time I would ever talk with her? The last time I ever heard her sweet voice? It was later in my life that I realized that when someone crosses your mind for no apparent reason what-so-ever, pay attention. You may need them. They may need you. Take action. Reach out!! Most recently, I was out running errands on my own. My friend D ran through my mind. Hadn’t talked to her in ages and hadn’t seen her in even longer. I followed my own advice: she crossed my mind, so I sent her a quick text. She invited me to go shopping and then dinner with her that night. Later we spent hours looking for new clothes. Due to an injury that forced her immobile for months, D had put on a few pounds and was in desperate need of new duds until she could get the extra weight off (which we both knew would simply be a matter of time). Like most of us, the idea of buying a LARGER size in anything is overwhelming and maybe even self-defeating. She had put off shopping for too long and was now busting at the seams of many of her clothes. It was time. D confided in me she didn’t want to endure the simple truth that she had put on weight. Buying a larger size made it real. I’ve certainly been there at some point… completely nerve-racking… not to mention a blow to my ego. I could dig it. After a whirlwind shopping trip, D had everything she needed. Ohhhhh, it was great fun. At dinner she told me, “Thank you so much. If it hadn’t been for you… I probably would have found something else to do rather than force myself to shop!! And I’m thankful you are the type of person who is brutally honest, so I’m confident everything I bought looks great on me because you would tell me if it didn’t.” This made me smile!!! See, I followed my inner voice. I’m so happy I listened. D needed me to provide her strength to do something she didn’t really want to do. We spent hours and hours talking in the process. It truly was a phenomenal night. Completely random? Yep. FABULOUS? Hell to the yeah!!! Pay attention to your life. Fine tune your hearing to pick up the faint voice within yourself. Never miss an opportunity. Go inside. Magnify. Turn up the internal volume and if necessary turn down the external volume that may muffle your focus. Your voice is there for a reason; whatever it may be… to guide you; to protect you; to help you make memories; to allow you to help others. And even when you don’t even realize it… to say goodbye to a dear friend and loved one before his or her time on this earth is gone!!!! Love my “inner voice”. Thanks for sharing! Always a pleasure….such a cool blog. My inner voice says: Pizza, Mc Donald’s, double mashed potatoes a fair bit, so I do have to select my reception at times. I do get this kind of knowing though. I sense it more when I am away from home and out of routines where it almost becomes a guide. Amazing how many times it has got me out of a scrape or made me check something out that was just wonderful. It is so important to listen to “the still, small voice inside.” I repeatedly got the message to call an old friend of mine one day and “the voice” wouldn’t leave me alone until I called her. It turned out she was contemplating suicide. Thank God I listened to “the voice” and followed through. She is still alive today, several years after I made that phone call. ALWAYS pay attention to your intuition, if you want to call it that. How wonderful you had that one last chance to spend time with your friend because you let the car drive itself to her house. Thanks for sharing such a touching and poignant story, Renae. You are a blessing! Laelia, you’re a treasured gem!! I’m honored by your reblog!! Thank you so much!! A great reading into this subject, both on a literary but also psychological level is Pullman’s Trilogy, “His Dark Materials”; there he peels the issue to its core, naming the “inner voice” “daemon” or “daimon” as it’s also used, which of course has nothing to do with christianity’s concept of demons which is a later adaptation/distortion of the original concept. Duh, what was my name? Thank you for giving me the heads up about Pullman’s Trilogy, “His Dark Materials” – I will need to check it out!! HAPPY 50th!! Make it a rockin’ good year and your BEST EVER!! Thanks for your support!! LOL @ ridicuryder – good 1. Yes Renae – you’ve gotten that right. I agree with you and everyone else on the panel. Far too long do we ignore the inner voice which is why I believe most of us live in saddened, monotonous states. My inner voice was speaking to me for three (3) years about my career path, due to fear, what my dad would say and what everyone else would say, I ignored it for those three years. You know how it goes though, the more you try drowning it, the louder it becomes, then I finally listened to it and made the change, could have never been HAPPIER! I listen to it all the time now. Why I choose selectively what I do or don’t do based on Society’s standards, it’s because I recognize by and large we fail ourselves without even trying; we tell ourselves no before we even imagine what yes can feel like and we react negatively before we can even seek the positive side of things. As usual – Great writing. I love it – Keep sharing dearie! Oh, Melissa… I’m so happy for you that you FINALLY listened to your inner voice. Better late than never!!! Keep listening!! Only, may I make a suggestion… that you listen earlier and/or quicker? LOL!! Thanks again for your continual support!! Yes indeed, consider done! I most certainly will. Lol. Inspiring, truthful, and a great reminder! Thank you! Blessings right back to you, Lori 🙂 I’m so grateful you found Candy Coated Reality!!! 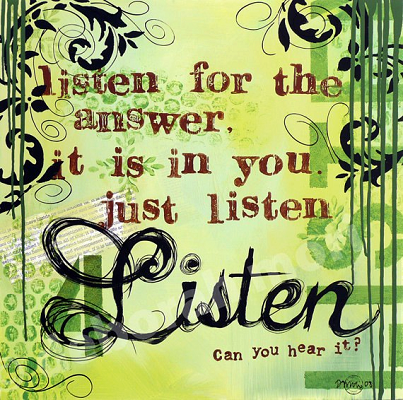 Thank you to © Renae Rossman and Candy Coated Reality™ for her article on listening to one’s own inner guidance. “Know Thyself” includes listening to one’s inner wisdom, reflecting, and taking action on the inner voice of guidance. Renae also beautifully qualifies it with two examples of her action and benefits to her friendships. Please read and share your own examples, stories, insights, comments and questions. Very happy to hear from you! Lori, I’m so honored by your reblog!! Thank you so much for your support!!! I’m so incredibly honored by your reblog!! Thank you so much!!! Alisandra, thank you!! 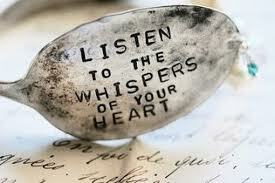 Yes, if we can catch the whispers our life is so much better off, INDEED!! 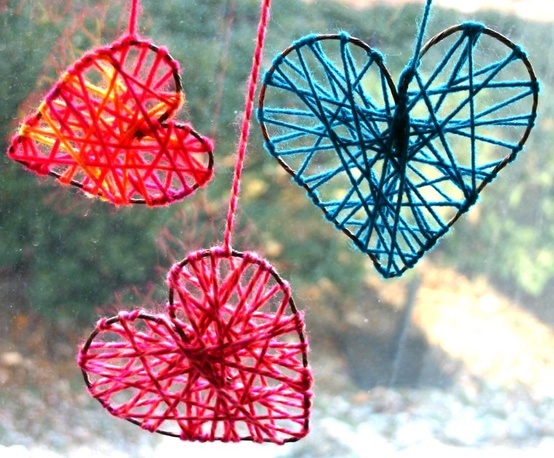 Sending you love and light! Thank you for this very powerful message. I so enjoyed this post. It’s taken me years to hear that inner voice, but I NEVER ignore it now. It’s a “godsend” just like you said. I totally believe that. Oh — and the appearance of your blog is superior. Do you do you own art? If so, kudos to you. Thanks, Barbara!! I’m so thankful for your support!! Nope, I do not own my own art… I just love art, lovely things, and color, color, color 🙂 It brings my heart such joy when someone tells me they like my little blog!! THANK YOU!!! Thanks for stopping by Candy Coated Reality 🙂 xo!! NIce blog! Thanks for stopping by and liking mine! Thank you!! Sending you love and light, my friend!! Makes sense: you always know what is best for you even when u think u don’t know, your soul knows what is best for you and sometime we can hear it crying out loud: “U idiot don’t do that” or “U idiot do that and fast”. That part about your friend and her misfortune made me feel extremely human, we all need rush to love others, cuz we don’t know how long they will be with us. ABSOLUTELY, yes we always know… unfortunately too many of us ignore it (including me… too many times to count). I hope I’ve learned my lesson and will always quiet the world around me, so that I can pick up the faint whispers from my soul 🙂 Sending you love and light!! God bless you and yours!! I saw the link to this post on my friend’s blog. What a beautiful post Renae (and yes, I have been careful to make sure I spelled your name correctly – lol). Our inner voices are such gifts, aren’t they? Too bad it is so easy to get caught up in the busyness of life – the hectic, do 300 things at once, kind of life we think we need to live – and we miss out on hearing this wise voice. Here’s too all of us choosing to slow down, quiet down, and listen for these gifts our inner voice is trying to give us each and every day. YAH RAH, you did spell it right… Ha!! You’re the best!! Thank you for your read and your comment… I couldn’t agree with you more!! I’m so thankful you decided to checkout Candy Coated Reality!! I pray we all take moments “slow down, quiet down, and listen to these gifts our inner voice is trying to give us each and every day” – well said, my friend! !